Do not apply this product in a way that will contact adults, children, or pets, either directly or through drift. Do not allow people or pets to enter the treated areas until vapors, mists, and aerosols have dispersed and the treated area has been thoroughly ventilated. Do not water the treated area to the point of run-off. All outdoor applications to impervious surfaces such as sidewalks, driveways, patios, porches and structural surfaces (such as windows, doors, and eaves) are limited to spot and crack-and-crevice applications, only. Application is prohibited directly into sewers or drains, or to any area like a gutter where drainage to sewers, storm drains, water bodies, or aquatic habitat can occur. Do not allow the product to enter any drain during or after application. SHAKE WELL BEFORE USING. Point spray nozzle away from face. Hold can at a slight downward angle. For best results, spray when air is calm. Allow a few minutes for product to take effect. Spray with wind if slight breeze is blowing (i.e. under 5 mph). Flies, Mosquitoes, Flying Moths, Gnats and Wasps: Spray area infested with these flying insects. Hold container 5-10 ft away from shrubs, bushes and grassy areas. Spray these areas with a slow sweeping motion at the rate of 1 to 3 seconds per cubic yard of space while moving away from the treated area. To reduce annoyance from these pests treat open porches and patios in a similar manner. Allow fog to drift over area. Give special attention to breeding areas such as garbage cans and compost piles. Spray only when the air is still. Allow spray to dissipate before occupying the treated area. Repeat as necessary, but no more than once per day. 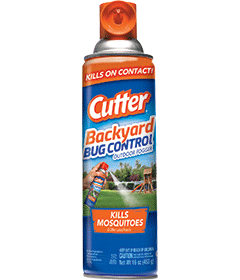 Ants (except carpenter, fire, pharaoh and harvester ants), Crickets, Sowbugs, and Firebrats: Spray infested surface of patio, campsite, deck or picnic area hitting as many insects as possible. Also spray legs of tables and chairs to repel ants. Spray ant hills for best control. Keep 5 to 10 feet away from ornamental plants while spraying. Repeat as necessary, but no more than once per day. CAUTION: Causes moderate eye irritation. Avoid contact with eyes. Do not get on skin or on clothing. Harmful if swallowed or inhaled. Do not breathe vapor or spray mist. Wash thoroughly with soap and water after handling and before eating, drinking, chewing gum, or using tobacco. Remove and wash contaminated clothing before reuse. If in Eyes: Hold eye open and rinse slowly and gently with water for 15-20 minutes. Remove contact lenses, if present, after the first 5 minutes, then continue rinsing eye. Call a Poison Control Center or doctor for treatment advice. If on Skin or Clothing: Take off contaminated clothing. Rinse skin immediately with plenty of water for 15-20 minutes. Call a Poison Control Center or doctor for treatment advice. Have the product container or label with you when calling a Poison Control Center or doctor, or going for treatment. You may also contact 1-800-332-5553 for emergency medical treatment information. This pesticide is extremely toxic to aquatic organisms, including fish and aquatic invertebrates. Do not apply directly to water. Do not contaminate water when cleaning equipment of disposing of equipment washwaters or rinsate. Drift and runoff may be hazardous to aquatic organisms in water adjacent to treated areas. This product is highly toxic to bees exposed to direct treatment on blooming crops or weeds while bees are actively visiting the area.